Lisa Lynn October 30, 2013 March 31, 2018 15 Comments on Scrambled Duck Eggs That Don’t Taste Like Duck Eggs! For the first time since I was a kid, I’m eating duck eggs! I ordered Pekin ducklings this spring and now have 5 ducks and 1 drake. We usually get 5 duck eggs a day and they are starting to pile up in the fridge! 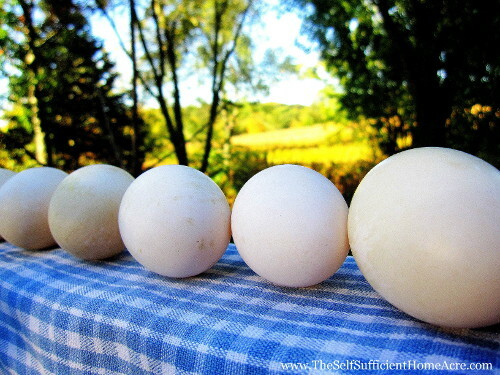 I recently shared some other ideas for using duck eggs and most of them involve baked goods. I really didn’t care for the flavor of duck eggs when I first tried scrambling them. But I accidentally found a trick for making them taste a bit more like chicken eggs. The other morning I made French Toast and had extra egg mixture leftover. I always cook the extra up into scrambled eggs, but was unsure if I’d like the duck egg mixture. Well, we’re not going to waste eggs around here, so I scrambled the duck egg mix and served it up with the French toast for breakfast. And ya’ know what? It tasted like chicken eggs to me. 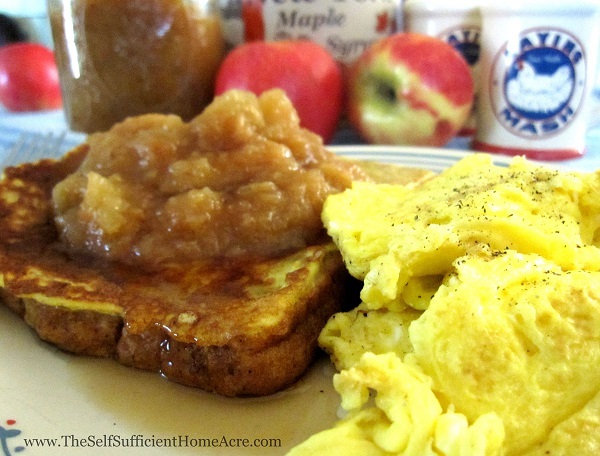 So here is my recipe for Scrambled Duck Eggs! Beat eggs and milk well and cook in a hot, greased frying pan. Add a dash of salt and pepper to taste. Love our ducks, mess doesnt bother us, the kids love the ducks and duck eggs cant be beat for baking! I’m getting used to the ducks making a mess…I put a big tray under the water dish so it doesn’t soak the gravel floor so much. Now that it is warm outside they are going out and playing in the outdoor water, so it’s getting better. Just starting to get eggs from my young ducks! Enjoy those duckies! I love my ducks, they are the clowns of the barn yard. So totteringly funny on land and so graceful in the water. We spent several days digging a pond, lined it with heavy plastic, so we could watch them swim, dive and float on the water. Unfortunately, they sliced the plastic with their sharp claws and the water leaked out. The nearby fruit trees loved the water and I got the best crop of apples ever. Love duck eggs .have two Peking and two Indian runner cross ducks . The Indian Runner ducks are so much fun to watch 🙂 Someday I’d like to try raising some. Are their eggs similar to other duck eggs? Inside just as you describe. I look forward to your scrambled egg trick! Good production! Especially for a beginning layer. 🙂 Best wishes! I have to chuckle for a few reasons. One, we don’t like duck eggs. We set them aside for baking. Two, we also got Pekin ducks this last spring and ended up with 5 ducks and 1 drake. Three, my kids would probably rather just cook the ducks! They hate caring for them. They are sooooo messy and stinky. But, we keep up with the care. That’s funny 🙂 They are a messy bunch to have in the coop and barnyard. My biggest gripe would be all the water that has to be changed several times a day to keep them happy! HAHA! This totally made me laugh out loud!! I saw the email 🙂 Just say the word when you’re ready to try some!